Google's new Top Charts show the top searches in the U.S.
Google revealed a new feature of Google Trends today, announcing that Top Charts will now be published every month. The Top Charts are similar to Google's annual Zeitgeist feature wherein Google publishes a year's worth of search trends every December. The new Top Charts will do the same, only monthly. 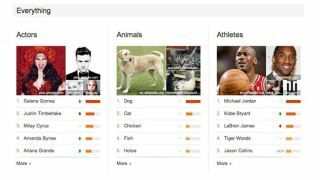 Google's first Top Charts, published today, reveal stats ranging from top-searched actors (Selena Gomez) to top "quick service restaurants" (Pizza Hut) and dog breed (pit bull). Currently only statistics from the U.S. are available, but Google promises that more countries are "coming soon." Google's 2012 Zeitgeist revealed last year that "Gangnam Style" was the top search term in Australia, and we've no doubt that Top Charts will eventually convey equally indispensable facts. Google's Top Charts are built on the search giant's Knowledge Graph and purport to show actual trends and not just raw keyword data. The Top Chart lists are divided up into categories like actors, scientists, TV shows, whiskeys, and dozens more. There are 40 total. Google also unveiled a curious new animated visualization of the top trending search terms that updates automatically in real time. It fills the browser with changing colors and search terms in a variety of languages, and can be customized to show different regions and terms. The Google Trends homepage will now show elements of these new features, as well as the standard trends features that you're accustomed to. See what else Google has been up to with our Hands On: Google Glass review.